Hello there from Meg&Me Photography and Happy #NationalUnicornDay !!! 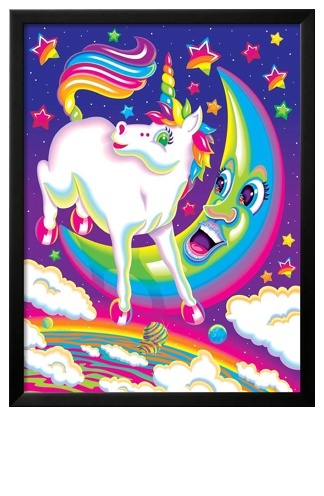 Growing up as a child of the 90’s, I was way ahead of the unicorn trend in my love of all things unicorns. Can you say Lisa Frank?! 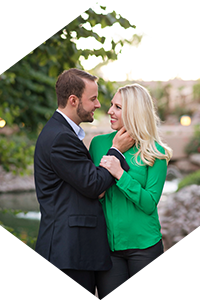 I loved everything colorful, sparkly, and fun and I still do! So, unicorn themed events are some of my favorites. In celebration of National Unicorn Day, here is a fun inspiration for a unicorn garden party! Some wonderful resources for party planning are Pinterest and Instagram! The only problem you will have is trying to stop yourself from pinning too many different ideas!! There are so many different DIY ideas which are great for someone with a budget or with a need for a creative outlet! 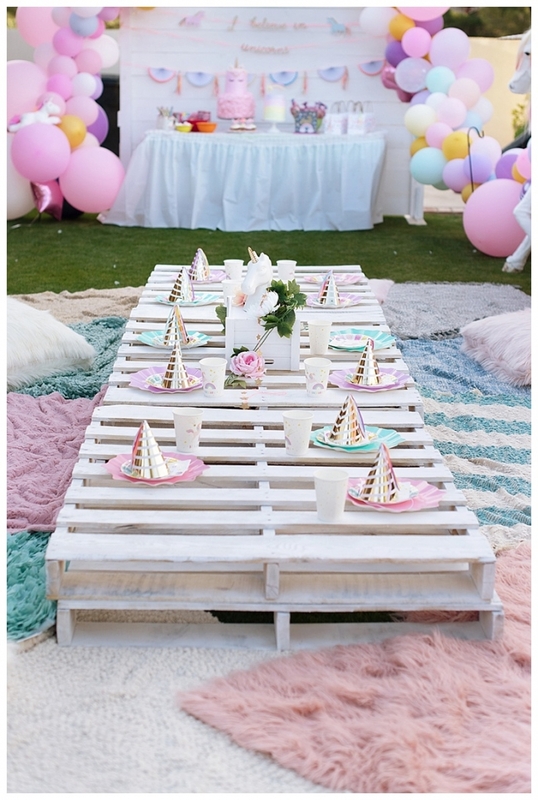 For example, for this garden party inspiration, I decided to go with a picnic theme, so I found bohemian picnic ideas using stacked wood pallets for tables. It looked like something fun, different, and budget friendly. So, I found some pallets for sale on FB marketplace and painted them using white spray paint from my local hardware store. And voila! A beautiful picnic table for the whole family. I decorated the table using a small white wood box from Hobby Lobby and an adorable Unicorn bust from Home Goods. I placed blankets and rugs around the table for a soft place to sit and sewed some pillows with furry fabric from Joanne Fabric and Craft Store. The unicorn hat, plates, napkins, and cups came from Home Goods. For the cakes, I decided to change up the stereotypical unicorn cake with a change in color and texture. I found inspiration for these cakes on Instagram. There are so many amazing cake artists out there. I added a rainbow mini cake and rainbow topper. I used cotton candy to coat the bottom layer of the unicorn cake. Pro tip (just kidding, amateur tip learned from experience!) – wait to put the cotton candy on until right before you will serve the cake. As the cotton candy sits, it starts to harden and shrink back into hard sugar crystals. I ordered the unicorn cake accessories from Amazon. The rainbow topper is by Meri Meri. 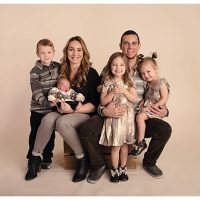 This company creates SO many adorable party decorations! The dessert table is a plastic folding table decorated with a skirt from the 99 Cent store and topped with a piece of irridescent fabric from Joann Fabric and Crafts. The unicorn banner, cupcake cups/toppers and gift bags are also by Meri Meri. I also placed “unicorn horn” suckers, Unicorn Pop Tarts, strawberry pirouline cookies, pastel M&Ms, rainbow marshmallows, unicorn Popcornopolis cones, and Cadbury eggs on the table. These were all a big hit! You can find the suckers and pirouline cookies at the 99 Cents store, the Pop Tarts, rainbow marshmallows, M&Ms, and cadbury eggs at Wal-Mart, and the Popcornoplis cones at Costco. 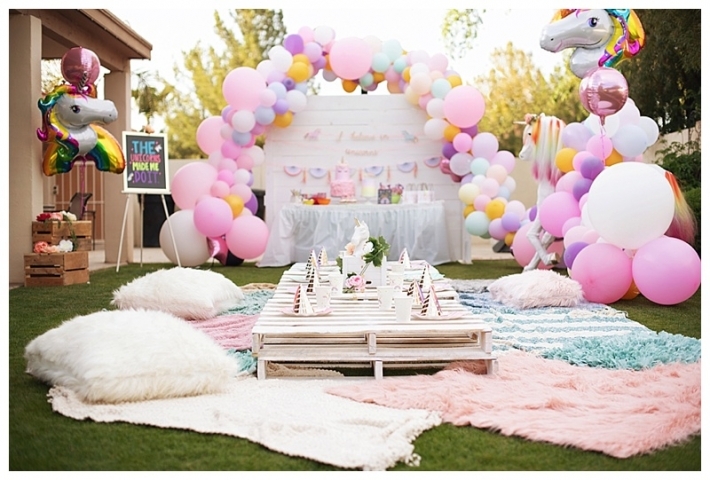 The over the top rainbow balloon garland really made this unicorn garden party extra special, and it was very budget friendly! I will admit that I was intimidated by trying to create this type of balloon garland myself, but after watching several very helpful youtube videos, I felt confident enough to tackle this project! Check out Anastasia Onishchenko on Youtube. Her channel has so many helpful tutorials and creative ideas! It’s awesome! I purchased many of the balloons from Ebay, Amazon, Hobby Lobby, and Walmart. I tried to find a mix of rainbow, confetti, Orbz, and large size balloons to create a whimsical garland that varied in color and size. I actually did the garland 2 days before I put everything else together. It took me a couple hours total, which is not a lot of time investment for such a large decoration! I invested in an electronic balloon pump from Amazon. I kept the garland inside until I was ready to put everything together. I used curling ribbon and tape to secure it outside as well as lawn hooks. The model unicorn was made for an elementary school book fair with an “enchanted forest” theme using upcycled amazon cardboard boxes, haha. It made a star appearance here for this unicorn inspiration. Check out this adorable unicorn bingo printable I found on Pinterest from Party Delights blog by Laura Maclean! It’s SO cute and fun to play with some skittles for game pieces. We laminated the boards to make them easier to use and reusable! And finally, one of my favorite parts of this unicorn garden party inspiration was this decorative sign that reads, “The unicorns made me do it.” It seemed like the perfect sign for this party, since I can’t resist all things unicorns! Hahaha. 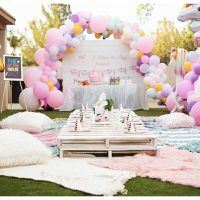 This would be a cute theme for many different types of parties from babies, kids, moms, and anyone who loves things magical, sparkly, and colorful. I hope you had as much fun with this unicorn inspiration as I did. Happy National Unicorn Day! !